Source: www.statslice.com/university-report. They will add updates to the report as they get additional feedback. Please email them at info@statslice.com to provide updates or additions. The Big Picture About Big Data. Can you connect the dots? This is what I see as happening in the world of Big Data as it relates to us an individuals. This is very personal. 2.) Personal Privacy is dying, dying dead!! 3.) Most of the computer titans are fighting the adoption of Personal Information Management privacy laws adoption. Silicon Valley stomps on digital disclosure bill. http://rt.com/usa/silicon-valley-stomps-privacy-bill-794/. Why do you think this is so important to these large Enterprise Players? Your personal information, web habits, and preferences are being recorded, stored, mind (Business Analytics tools), and sold to advertisers, aggregators and others. 5.) Major Enterprise Service Providers are harvesting and selling your information with or without your knowledge and or consent. “Financial analysts asked how Google will monetize new products such as Google Now, which functions as a kind of personal digital assistant to automatically give users information as they go about their day. In the context of this conversation Mr Page is referring to Users as “Individuals” and “People who are excited about Promoting it” refers to companies promoting their goods and services. Predictive analytics encompasses a variety of techniques from statistics, modeling, machine learning, and data mining that analyze current and historical facts to make predictions about future, or otherwise unknown, events. 7.) “If you are not paying for the service, you are the product”. 9.) A long followed process within the computer industry and other industries is called DIKW – Data, Information, Knowledge, Wisdom. From raw Data, Information can be surmised. From Information sources, Knowledge can be learned. With enough Knowledge, Wisdom is eventually achieved. And we all know that wisdom is Power! * Business Intelligence is all about gaining knowledge from Data and Information. * Your Personal Information is being captured, tracked and harvested without your knowledge, and or consent. * You have limited to no personal privacy when it comes to your personal information. * Major corporations are spending millions to make sure that the current state of privacy as it relates to personal information stays in the state it is. Meaning individuals have limited to no privacy as it relates to their personal information. * Many different kinds of data and information are being gathered and stored (Big Data) and aggregated in anticipation of near term information technology advancements in Business Intelligence tools, and Predictive Analytics tools. * Your Personal Information is being gathered, stored, tracked, mind, and packaged for sale to Enterprise scale firms for their use in the future. * One of the reasons you are not paying for complex services being offered up by some of the major brand name Social Media sites is that they are the ones gathering the data. Remember, “If you are not paying for the service… You are the product.” Meaning your personal information is the product. * The market is enormous (Trillions) for leaders in the field that will be able to mine the information, gain knowledge from that information, and have the wisdom to be able to predict your daily patterns and serve up products and services that you may or may not be interested in. What to expect. In the not too distant future, firms like Google, Facebook, Yahoo, Microsoft, Amazon and others will be able to serve up suggestions for your needs on an ongoing basis, either solicited by you, or unsolicited, depending on how you have set your personal preferences to be “Fed” information. Amazon does this now in a static mode with their suggestions features, from the Wisdom they have gathered and gained. This will become more invasive and prevalent You will be able to walk down the street and be instantly informed of what the local merchant community is serving up and pushing at the moment. As you drive down the street, ads will flash by on your embedded and or mobile devices pushing what the merchants perceive as either your patterns of purchase or what they are pushing at the moment. My stance is neither pro nor con on this coming title wave of information headed your way as a result of the convergence of many disparate technologies. It is up to you to decide how to manage this data deluge. I hope this puts a few of the current trends into perspective and helps you understand what these technologies are about, and some of the uses of Big Data, Business Intelligence, and Predictive Analytics. Why they are important to the Industry titans. And how they will eventually enter into and effect our personal lives. Very soon this will get very personal. 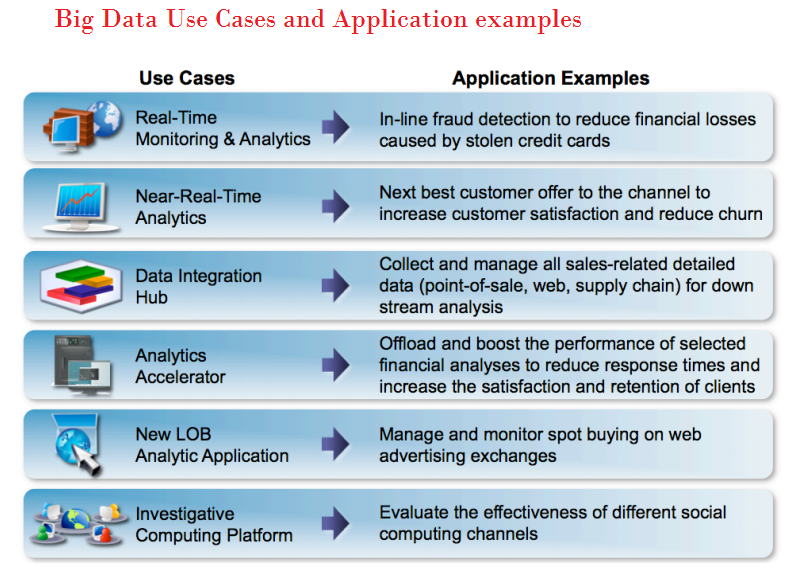 Smart data scientists use data virtualization to integrate data from many diverse sources – logically and virtualized for on-demand consumption by different data analytical applications. For example, data virtualization is used to address challenges such as rogue data marts, business intelligence apps, enterprise resource planning and content systems and portals. Data virtualization is the process of offering data consumers a data access interface that hides the technical aspects of stored data, such as location, storage structure, API, access language, and storage technology. Consuming applications may include: data analytics, business intelligence, CRM, enterprise resource planning, and more across both cloud computing platforms and on-premises. Data virtualization abstracts, transforms, federates and delivers data from a variety of sources and presents itself as a single access point to a consumer regardless of the physical location or nature of the various data sources. Data virtualization is based on the premise of the abstraction of data contained within a variety of data sources (databases, applications, file repositories, websites, data services vendors, etc.) for the purpose of providing a single-point access to the data and its architecture is based on a shared semantic abstraction layer as opposed to limited visibility semantic metadata confined to a single data source. • Abstraction – Abstract data the technical aspects of stored data, such as location, storage structure, API, access language, and storage technology. • Virtualized Data Access – Connect to different data sources and make them accessible from one logical place. • Transformation / Integration – Transform, improve quality, and integrate data based on need across multiple sources. • Data Federation – Combine results sets from across multiple source systems. • Flexible Data Delivery – Publish result sets as views and/or data services executed by consuming application or users when requested. In delivering these capabilities, data virtualization also addresses requirements for data security, data quality, data governance, query optimization, caching, etc. Data virtualization software includes functions for development, operation and management. Splunk Inc. (NASDAQ: SPLK), the leading software platform for real-time operational intelligence, and Hortonworks, a leading contributor to Apache™ Hadoop®, today announced a strategic alliance to enable organizations to gain operational intelligence using open source Apache Hadoop. The alliance ensures that organizations can take advantage of Splunk® Enterprise and Hortonworks Data Platform (HDP) utilizing Splunk Hadoop Connect, which easily and reliably moves data between Splunk Enterprise and Hadoop. Neustar, a trusted provider of real-time information and analysis to the Internet, telecommunications, information services, financial services, retail, media and advertising sectors utilizes both Splunk Enterprise and HDP to help its customers promote and protect their businesses. Visit the Splunk website to learn more about Splunk Enterprise and Splunk Hadoop Connect. To learn more about the Hortonworks Data Platform, visit the Hortonworks website. Hortonworks develops, distributes and supports the only 100-percent open source distribution of Apache Hadoop explicitly architected, built and tested for enterprise grade deployments. Developed by the original architects, builders and operators of Hadoop, Hortonworks stewards the core and delivers the critical services required by the enterprise to reliably and effectively run Hadoop at scale. Our distribution, Hortonworks Data Platform, provides an open and stable foundation for enterprises and a growing ecosystem to build and deploy big data solutions. Hortonworks also provides unmatched technical support, training and certification programs. For more information, visitwww.hortonworks.com. Splunk Inc. (NASDAQ: SPLK) provides the engine for machine data™. Splunk® software collects, indexes and harnesses the machine-generated big data coming from the websites, applications, servers, networks, sensors and mobile devices that power business. Splunk software enables organizations to monitor, search, analyze, visualize and act on massive streams of real-time and historical machine data. More than 5,200 enterprises, universities, government agencies and service providers in over 90 countries use Splunk Enterprise to gain Operational Intelligence that deepens business and customer understanding, improves service and uptime, reduces cost and mitigates cybersecurity risk. Splunk Storm®, a cloud-based subscription service, is used by organizations developing and running applications in the cloud. To learn more, please visit www.splunk.com/company. Splunk, Splunk Storm and the engine for machine data are registered trademarks or trademarks of Splunk Inc., and/or its subsidiaries and/or affiliates in the United States and/or other jurisdictions. All other brand names, product names or trademarks belong to their respective holders. © 2013 Splunk Inc. The data that companies collect used to be considered intellectual property, to be protected and shared only with a select few. Today, there is an abundance of data—some would say an overabundance—with a wide array of tools to analyse it. Executives are beginning to realise that, if the deluge of information is to be exploited to the full, information should be widely shared, not hoarded. Only then can firms gain the insights that will put them ahead of their rivals.